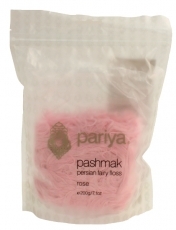 Pashmak is a traditional handspun Persian sweet that's similar to traditional fairy floss (or cotton candy) without the grit. Expert confectioners hand spin each batch of delicately sweet Pashmak into a fine weave of rose wool-like strands that simply melt in your mouth. Pashmak is delicious and effective garnish for cakes, puddings, fruit, ice cream or even better- on its own. Simply mix and match the flavours to suit your cravings!